All of us at least once used coupons to discount from a store and you agree that it’s not bad to purchase some necessary or desired goods with much lower price. Every store owner who cares about sales should provide coupon codes from time to time. In most cases this forces customers to comeback again and make even more purchases than was planned. 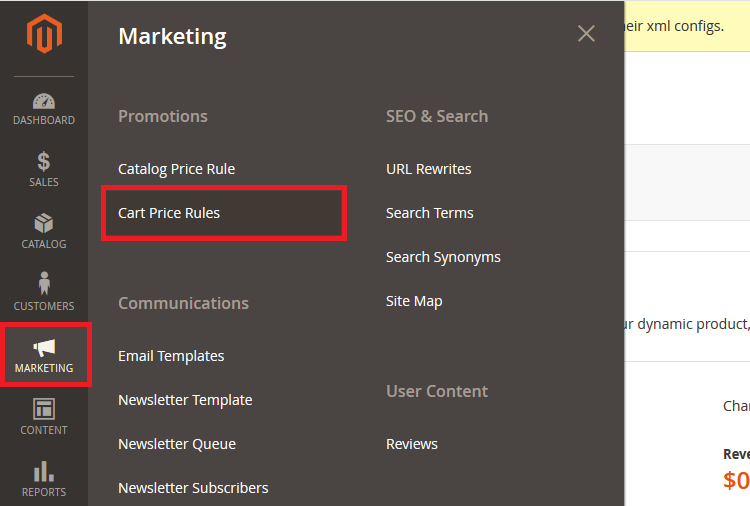 Navigate to Marketing -> Promotions -> Cart Price Rules section. Click the Add New Rules button. In the Rule Information section fill in all required fields. (See a screenshot below). 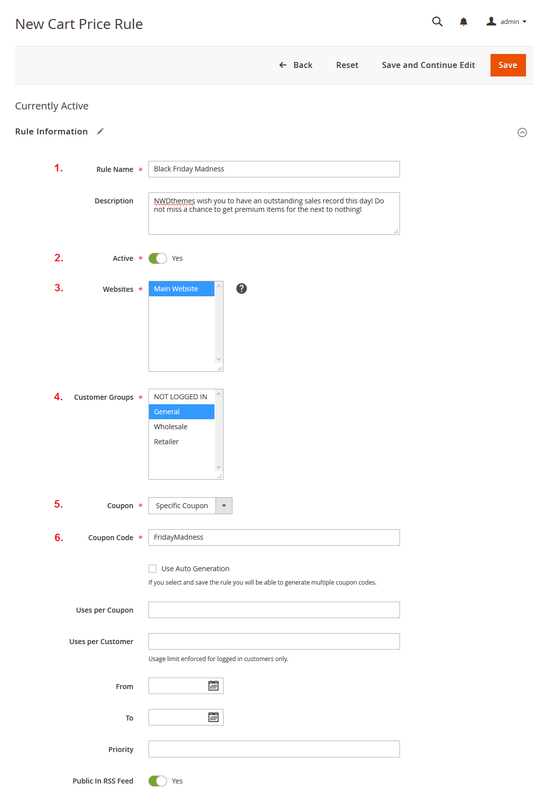 Apply specific rule conditions or leave this section untouched to apply them for all products. Set the discount amount and additional actions if necessary. Finish managing the coupon code. If you used to work with Magento 1 before, you can remember its admin panel gloomy design and tons of same options that are not very intuitive. Without specific knowledge it was a nightmare to manage one or another section in your store sometimes. 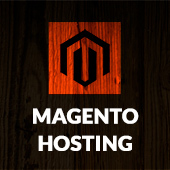 In Magento 2 the developers put their best to create as user-friendly admin panel as possible with a modern design. 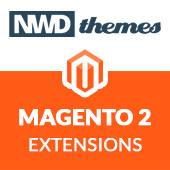 But the best benefit is that they have finally grouped all settings in sections that are now intuitive and easy to reach even if you never used Magento. 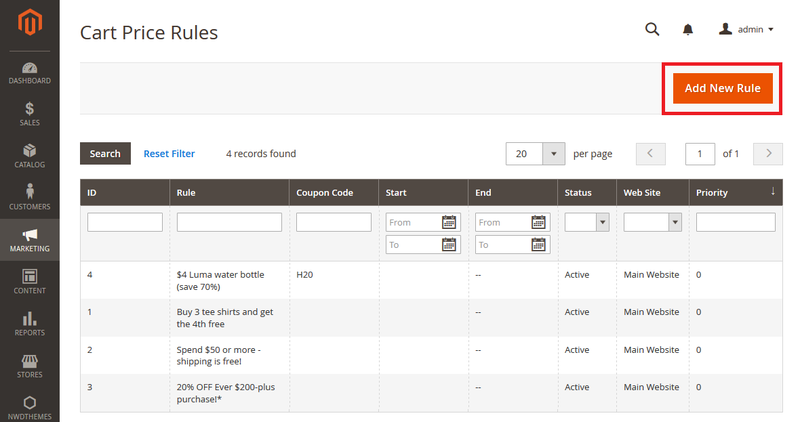 On a “Cart Price Rules” page you can see a list of already created rules that can be used for testing purposes. You can also make some slight changes to fit your needs and apply them for your store or create new rules from the scratch. Here you can set the the name of your coupon code promotion (1), select websites on which the coupon code will be applied (3) and define customer groups that can benefit from the discount (4). Set Coupon option (5) as “Specific Coupon” and apply the Coupon Code (6) that your customers will need to enter in cart to purchase products with a discount. If necessary you can also use some additional options such as: coupon code auto-generation, limit the number of uses per customer and set up the period when your coupon code is applicable. In this section you can set under what conditions the discount will be applied, so if you allow discount for all products just skip this section and leave it as it is. Here you should choose whether the discount amount will be fixed or percent of product price. Then apply the Discount Amount (1). In addition you can also set other options from this section. Magento 2 admin, magento, magento 2 development, sales. permalink.